Clarify your system. Simplify your trading. You Don't Have to Search for the Next Big Stock to Get Big Returns! 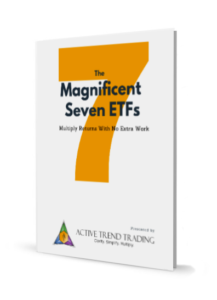 Get a FREE copy of our report that tells you how to make great trading returns watching just a few ETFs. 7 Magnificent ones, to be exact. 24-Hour access to educational content, webinars with live examples, and archives with historic data. No more guessing. Discover the simple technical tools that give confidence to your trade decisions. Look over the shoulder of a Certified Market Technician. Get live text and email alerts about trades we’re taking. Our 3 simple strategies help you manage your investments, whether you want portfolio growth or income. Emotions can wreck your investments. Learn to execute trades automatically based on objective criteria that won’t keep you up at night. Get the tools to trade with limited time. Many people trade with Active Trend Trading in just a few minutes a day. Get expert analysis and ask questions about live trades during weekly webinars only for members. Cheat sheets and road maps that summarize the lessons. Download or print them for reference when trading.